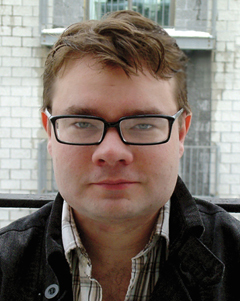 Benjamin Hale is the author of the novel The Evolution of Bruno Littlemore (Twelve, 2011), and two new books of fiction, The Fat Artist and Other Stories, and The Grid, which are forthcoming from Simon & Schuster. He has received the Bard Fiction Prize, a Michener-Copernicus Award, and nominations for the Dylan Thomas Prize and the New York Public Library's Young Lions Fiction Award. His fiction, essays, and reviews have appeared in Harper’s, Conjunctions, New York Times Book Review, Washington Post, and Dissent; and he has been anthologized in Best American Science and Nature Writing 2013. He is a senior editor of Conjunctions and teaches at Bard College.